Hinoki and the Bird is a modern, travel-inspired Los Angeles restaurant that has a lovely built-in aesthetic, making it an ideal setting for events of all kinds, as well as photography. It's also a wonderful venue for an intimate Bar or Bat Mitzvah celebration after the temple service. 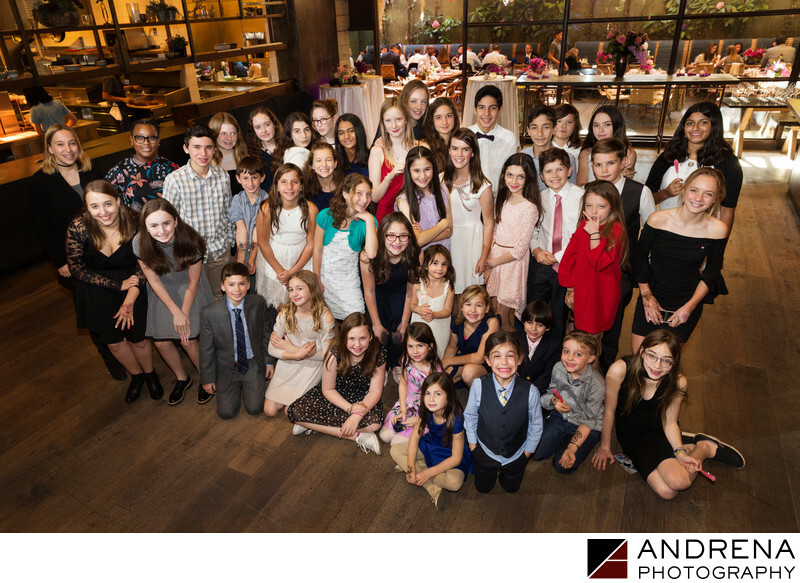 No mitzvah celebration would be complete without the ever-important overhead group photograph of all the mitzvah girl or boy's friends. In images like these, the kids' photo attitudes can range from composed to silly to celebratory, but whatever the vibe, we always know seeing everyone in one frame is such a happy memory for everyone. We also love that you can see a view of the restaurant's patio through the windows behind the kids to the right, showing a glimpse of the elegant table settings and floral design that helped make this party one of a kind.